Heat oil in large skillet over medium-high heat until hot. Add pork, garlic and hoisin sauce; cook and stir 4 to 5 minutes or until pork is no longer pink. Add bok choy, carrots and onions; cook and stir 1 minute or until vegetables are crisp-tender. Spoon about 1/2 cup pork mixture onto half of each warm tortilla. Fold each in half. Serve tacos with tempura sauce. Pan-ethnic recipes, those that combine elements from more than one ethnic cuisine, are a popular food trend. 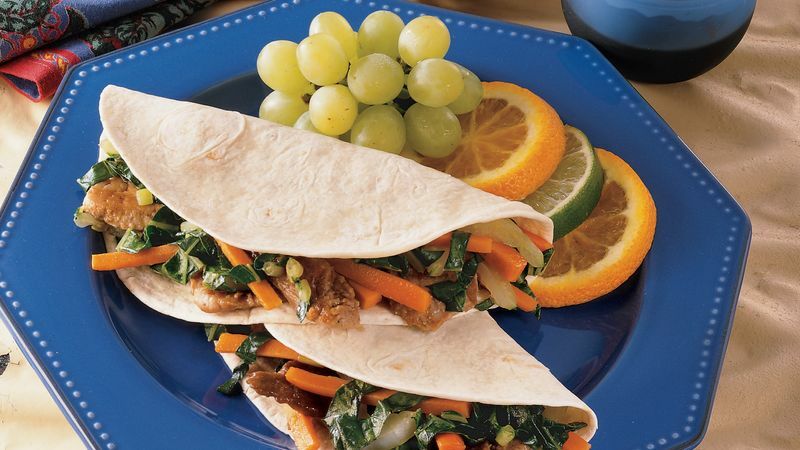 This recipe melds Asian ingredients with the Mexican style of folding ingredients into a tortilla. Mandarin pancakes, Chinese crepes made with wheat flour, can be used in place of the flour tortillas. Purchase these specialty pancakes at Asian markets or restaurants.